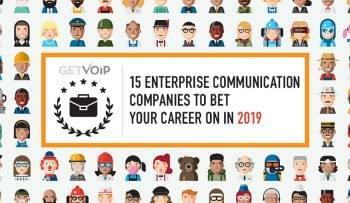 It’s an exciting time for anyone making a career in VoIP. A recent forecast by Infonetics research predicts that combined business and home VoIP services will be worth $75 billion by 2015. Companies of all shapes and sizes are staking out their territory, from established IT and telecommunications multinationals to local startups. You’re talented, hard-working, and ready for a challenge, but how do you decide which VoIP company is right for you? Glassdoor offers a unique insider’s-eye-view into the truth behind the glossy brands. Rating their satisfaction with all aspects of their job, employees have shared their experience to help you crowdsource the perfect fit. 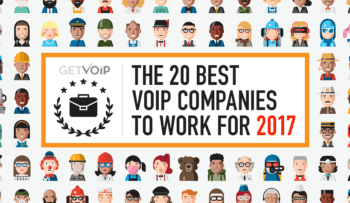 We’ve gone one step further for you and combed through the listings to put together this list of the best VoiP companies to work for in 2014. 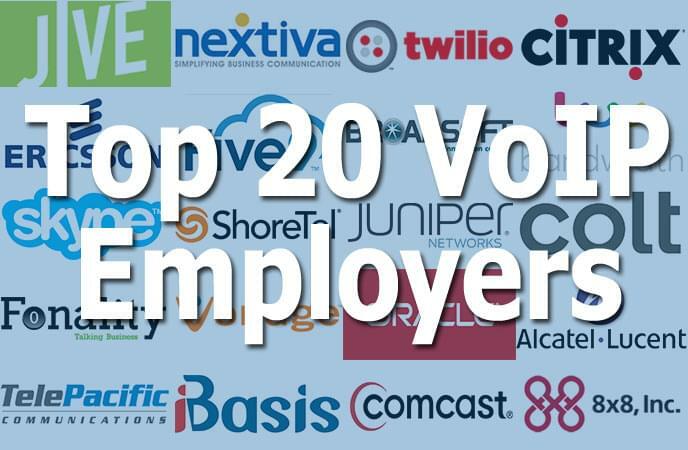 These twenty companies, produce industry-leading VoIP technologies, infrastructure, and services while offering top-of-the-line compensation, benefit packages, and perks to the employees who fill their ranks. Work-life balance, responsibility, and company culture all contribute to rankings. Our list is ordered from highest-ranked to the lowest, but each one is a winner: we looked for companies with consistently high employee satisfaction ratings of 3.0 or above, and CEOs who have gained the confidence of their employees. Employees are unanimous in their praise for this growing company, based in Orem, Utah. The passionate, driven, and caring work community is cited as one of the top draws. Workers are impressed with the cutting-edge product and feel supported by management, who are frequently referred to as open, generous, and devoted to employee development. The fast pace and pressure to succeed are balanced by a fun environment. Jive is expanding incredibly fast, which offers both challenges and seemingly endless opportunity for advancement. Based in Scottsdale, Arizona, Nextiva has been around since 2006. Its loyal employees are vocal and unanimous in expressing their love for the environment and culture. Management makes a point of identifying and fostering talent. It’s a fast-paced and challenging environment, but employees say that they feel supported and appreciated on a day-to-day basis as well as in their long term career goals. There’s a strong sense of mutual respect between the company and its workers, with everyone pulling together to deliver exceptional service. People say their co-workers are intelligent, driven, fun, and warm. When pushed to identify a negative aspect about working for Nextiva, most reviewers resorted to jokes: several said that all of the delicious free food was making them fat! This San Francisco startup is growing incredibly fast, which employees say makes for a thrilling work environment. Growing pains can be felt from time to time: efficiency can be compromised by continual new hires and team re-shuffling, and there is constant pressure to succeed. The shiny side of that coin is a vibrant, exciting office culture with loads of room to grow along with the company. Perks include free meals, well-planned company events, and weekly chair massages, as well as Kindle and gym allowances. This multinational bills itself as a “cloud company” from top to bottom, with a mobile workstyle at the heart of their culture. The freedom and flexibility to work remotely has many employees praising Citrix as a great place to find work-life balance. That said, the in-office perks such as snacks, ping-pong tables and attractive layouts entice most employees onto campus on a regular basis. The company has been around since 1989 and workers appreciate its status in the industry and feel that its marketing is top class. In a company this size, there can be quite a variation in employee experience from location to location, but when the fit is right, there are continuous opportunities for advancement. Because many groups will hire employees right out of college, it can be an especially great place for people at the beginning of their careers. Headquartered in Stockholm, Ericsson-Worldwide really lives up to their name, with a truly global presence. Employees say that in spite of its enormous size, the company is devoted to treating its employees well. Fairness and flexibility are paramount, which is important in the demanding work culture. A high level of performance is required at all times, and some employees found that rivalries between teams could be overblown. Workers appreciate the openness and trust displayed by management, and the stability, longevity, and prestige of the company score high marks. 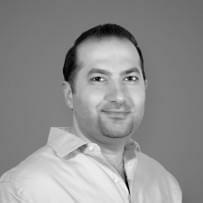 Based in San Ramon, California, Five9 is a company on the move. It’s constantly appearing on important lists of “fastest growing companies,” and that dynamic energy is one of the things Five9 employees love most. Life at the bleeding edge of technology isn’t always easy, but while workers mention occasional strain, overall the tone is one of excitement at the constantly expanding opportunities. BroadSoft is based in Gaithersburg, Maryland, with a surprising number of additional locations for a relatively small company. Offices in Belfast, Northern Ireland, and Sydney, Australia give the company an international focus much appreciated by its employees. Working in a small company with a global reach provides a unique opportunity to make an impact, especially when the company culture encourages employee insight. On the flip side, resources can occasionally feel stretched, and the quick decision making required to keep everything running can sometimes feel autocratic. The benefits package is comprehensive, and employees say that the HR department is exceptional. Colt boasts the leading pan-European network, with principal offices in 18 countries throughout Europe. The headquarters are in London, and they also have a growing presence in Asia. Employees praise the benefits and compensation scheme, which is considered better than average. 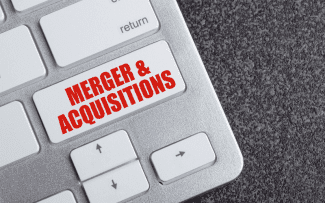 The company changes quickly and often, which is exciting but can also be unsettling. Some workers struggle with inter-office politics and an unclear protocol for advancement, but most were clearly happy to be working with excellent technology. There’s a strong sense of teamwork, and employees appreciate the company’s commitment to corporate social responsibility. This Raleigh, North Carolina company inspires rave reviews from its employees. Bandwidth.com really goes out of its way to help employees achieve that elusive work-life balance, investing directly in their health and happiness with very generous benefits and multiple programs designed to foster wellbeing. The innovative and fast-paced culture puts the focus on teamwork, and employees feel that their contributions are recognized and celebrated by the company as a whole. The work hard/play hard ethic is mostly appreciated by the youthful workforce. The consensus is that if the fit is right, you’ll never want to work anywhere else. One of the biggest names in VoIP remains a favorite with customers and employees alike. The company is headquartered in Luxembourg, with many offices across Europe, as well as a Palo Alto location. Employees love being associated with such a strong, popular brand and take a great deal of pride in their work. The perks are very popular, including snacks, parties, good benefits, flexible working arrangements, and a company culture that underlines the importance of loving what you do. The multinational reach of the company means that employee experiences can vary widely from office to office, but overall workers are thrilled to be a part of the company and enjoy coming to work each day. Headquartered in Sunnyvale California, ShoreTel inspires a strong sense of company spirit. Employees are motivated by a common belief in the excellence of the product. Every voice is valued, and workers say that the company does a wonderful job of fostering evolution and creativity by making everyone feel important. There is a great sense of teamwork and cohesiveness to the company, with employees willing to share knowledge and help each other out. The workload can be heavy, but employees find the warm atmosphere and positive culture encouraging. The lack of a 401k match bothers some people, though the other benefits are considered decent. The rapid company growth and recent management changes have contributed to a steep learning curve, but overall confidence is high. This Sunnyvale, California company topped last year’s list of the best paymasters in the Bay Area, rewarding employees with a significantly higher-than-average salary. Better base pay than Google, Microsoft, Facebook, Apple, and other industry giants sets Juniper in a class of its own. Employees appreciate that the company is open to new ideas, and enjoy the freedom of the generous work from home policies. While workers agree that the technology deserves to lead the industry, there’s some sense of being an underdog when compared to bigger names in the industry. A high degree of management churn can be a concern, but some people find the change of atmosphere offers opportunities to gain fresh perspectives. A strong sense of collaboration among teams creates a healthy work environment. Fonality is headquartered in Plano, Texas, and also has offices in California as well as Australia and the Philippines. They’ve been in the game since 2004. Employees enjoy the casual environment and company culture and the friendly people of Fonality come up again and again. It seems that any turbulence caused by management changes in the past few years have leveled out again. Most workers now say that they feel that management truly cares and will “go to bat” for their interests. Vocalocity is based in Atlanta, Georgia. Employees are impressed with both the calibre of technical talent and the rich opportunities for growth. The company is deeply focused on quality, which can leave some workers feeling micro-managed, but that same drive means that support, training, and conferences are available to interested individuals, paid for by the company. Another giant presence on this list, Oracle employs more than 120,000 people across the globe. Employees agree that when you work for Oracle, your destiny is in your own hands. For determined, driven individuals, almost unlimited training and advancement opportunities are available. The only catch is that you must be willing to work hard, stand out, and shine. Despite the enormous size of the company, workers appreciate that individual teams are close, with the energy of a start-up and the camaraderie of a hometown business. The pace can be intense, but inspite of a high degree of competition, employees say that teamwork rules, with incredibly helpful co-workers and an atmosphere of mutual support. It’s possible for quieter or less-focused employees to get lost in the crowd: you must be able to advocate for yourself and carve out your own niche. Benefits are considered to be very good, though compensation seems to be on the lower end of the scale. A respected multinational with exceptional name recognition, Alcatel-Lucent is headquartered in Paris, France, with operations in more than 100 countries. The company employees tens of thousands of people across the globe, and that internationality is a big draw. It earns high marks from its employees for a friendly and flexible working culture, especially as regards working remotely. The sprawling size of the organization means that there can sometimes be a lag in communication. Some employees worry about the long-term financial stability of the company, but most feel that the learning opportunities and prestige of Alcatel-Lucent will leave them well prepared, whatever the future may bring. This small company in Los Angeles offers employees a supportive atmosphere. Workers praise the focus and vision of the company, as well as the very high quality of the product. A very results-driven environment can lead to some employees feeling pressured, particularly in the sales department. In 2007, this Burlington, Massachusetts company was acquired by KPN, the Dutch national carrier. It is now a major player with one of the largest international VoIP networks in the world. Employees praise the technology-led strategy, where innovation and creative solutions are highly prized. There’s a lot to learn at every level, and the office culture is casual. This cable, communications, and entertainment giant has thousands of employees in over 30 countries. With more than 1500 reviews from employees at all levels and all departments, consensus is difficult, which makes these scores more impressive than they may appear at first sight. Most workers mention the great benefits and perks of working for the company, which include free or discounted services. Many employees appreciate the fact that motivated workers can advance even without a university degree. Training and support is provided at every level. Employees across many different departments note that time pressure and some degree of micro-management can be a challenge, but performance incentives are popular and appreciated. Situated in San Jose, California, 8×8 was founded in 1987 and remains on the cutting edge of telecommunications. Employees appreciate the combined power of a mature product and constant innovation. Day-to-day life in the company is fast-paced, with plenty of opportunity for motivated workers, but the pressure and competition can be intense. Employees praise the new, convenient location as well as a very competitive benefits package with lots of vacation time. It’s an amazing time in the industry, and if you can find the right fit, your future is bright. VoIP companies are still radically changing the landscape of telecommunications, and their power and provenance continue to grow each year. A recent forecast by Infonetics predicts that the combined business and home VoIP industry will be worth $75 billion by 2015. It all adds up to a vibrant job market, with top companies eagerly recruiting the best and the brightest into the VoIP revolution. You could be next.